Do you feel like we’re on some kind of schizophrenic parade through my flips? Welcome to my mind. Constantly bouncing back and forth between houses and designs! Flip 5 and Flip 6 couldn’t be more different! I left you hanging on the Flip 5 kitchen remodel (currently on hold…thanks, Flip 6). And then I introduced you to Flip 6. And here we are, back at Flip 5. Wine. It always helps when I’m trying to keep up! One of the rooms that I just loved when I first saw Flip 5 was the living room. The built-ins. The oversized mantle. The wood floors. The large windows. The room is really quite enormous for 1951 standards. And with the wall of windows, it’s no dungeon. It gets ample lighting, and I love this space. It’s a design nightmare. I have arranged this room. And rearranged. And rearranged. Then moved everything out of it. Then just stared at it. This is how I had the room laid out for the longest time. The deal that makes this room so difficult is that it’s a long narrow room as opposed to a boxy room. 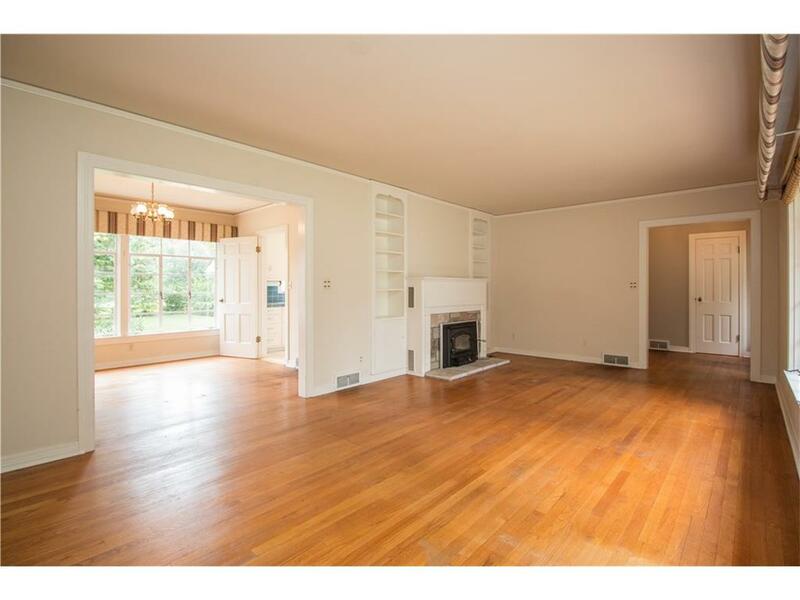 The room is also lopsided due to the built-ins and fireplace. *The couch is quite far from the TV (hard to tell in this picture). *The only available Internet hookup in the room is on the bottom right of the picture (out of shot). That means several cords are dangling mid-air from the TV. *The 2 arm chair accents in front of the window have to either be centered with the window or the fireplace. Not both. If they are positioned to face the TV, they are positioned AWAY from the couch. *We won’t even address I have no clue how to stage those built-ins. It’s hard to gain perspective from these photos, but the room is anything but quaint. Given the layout I currently have with the couch, two large accent chairs, and a pair of lucite accent chairs on the small wall near the fireplace, there are three groupings in this space. None of them are conducive to entertaining and communicating. The room feels so segregated. And if you’re sitting in the lucite chair on the left, you have to dodge dangling cords. This room is a challenge! *The bottom of the built-ins are actual doors that I utilize frequently, so I don’t want to block those. Other than that, I’m all ears to your design ideas! Sooo, ready-set-go! « Surprise! Welcome to Flip 6! Splitting the room seems to be a popular idea…and one I had not thought of! That may be the answer! I’m glad I’m not the only one with this problem! I would separate the room into different areas. 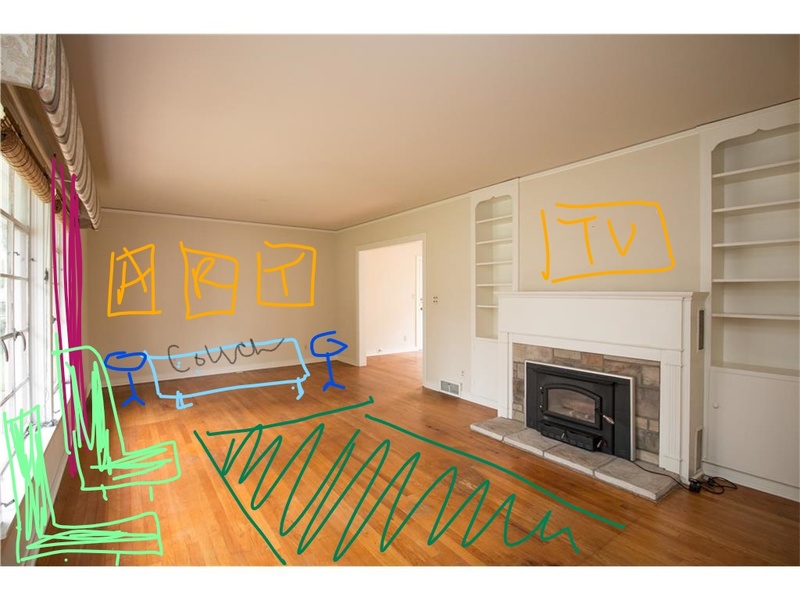 1) tv room around the fireplace with sofa and two chairs either side of sofa. Books and a few large colourful glassware pieces on the built-in-shelves (I have similar). Tall floor lamp on right of the built-in shelves, behind the single chair positioned here. Large picture on wall to the right of the tv/sofa. Small pic on wall to left side of built-in shelves. I probably would not use a rug in this room at all, because it is a lovely wood floor and it’s by the open fire but mostly I just like the feel of bare feet on warm wood. I would spend a little extra to tack all loose cables along the edges of the wall and skirting boards so it’s all neat. 2) I would build in a long low seat all along the large window (with storage underneath) and thick cushioned top (made of sponge cut to measure and easily covered with fabric). Hopefully, the view outside the window is a nice one and it would be lovely to seat here with a cup of coffee a book. 3) in the left side area of the room (to the left of the fireplace), I would position two large pictures on the wall and, in between, a tall piano, or a desk for a laptop, with a nice Art Deco table top lamp. I would also have a large standing floor lamp on the left corner of this part of the room that could be angled as necessary toward the piano/desk. I did a rough sketch on the two photos of the room but I couldn’t find your email address to send them to you so you can see what I mean and there is no way to attach them to the comments. I hope you can visualise the way I have described it. I think it would look very classic, simple, and stylish. BTW, I have been following your blog for a while and I am always fascinated by the ups and downs of your adventures, in turning these properties around, from house shells to homes. Keep up the good work and best wishes for Christmas and the New Year. I tried emailing you but it bounces back with message this mailbox is unavailable. Hey Marina- I have an email button on my page! 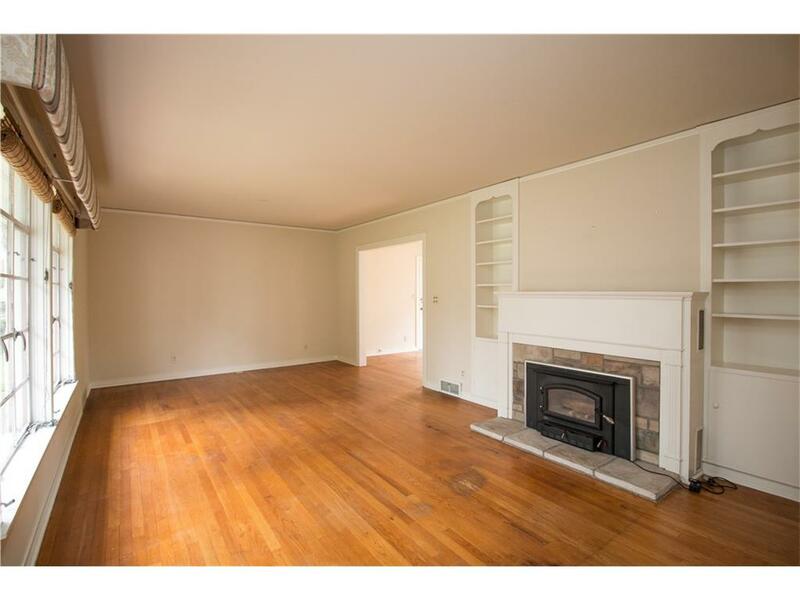 Id sort of divide the room…bring in couch towards the fire place, use far space for small games/cards table and four chairs. Put flowers on top when not in use. Put tv in upstairs room, it shouldn’t be in the living room. Friends come over to visit, not watch tv. I think this will give you elegance in a casual way, comfort and cosyness. Fill shelves with books and a few colourful pieces……voila. Good luck. You’re doing very well. Dividing the room seems to be popular! Unfortunately, the TV has to stay in this room. It’s either here or a bedroom…there is no upstairs. my 2 cents, a hardwired internet connection isnt an issue, since no one hardwires anymore, and putting a couch in front of a window is pretty common, even if its not centered. another option, with the market being hot, dont stage, let the buyer decide where their stuff fits, it should sell just fine without staging if your market is like mine where the inventory is low. Just food for thought. The Internet part is beyond me…ha! The modem/router is plugged in to the wall and the TV does not have bluetooth, so there’s a wire connecting the TV to the moden/router. That’s the extent of my knowledge! My brother in law did say he’d come see what he could do to alleviate the wire issue. That’s a great resource! Thank you! I had the same thought as Susan. Without dimensions, it’s hard to assign a home office to your art wall and turn your rug 90 degrees in the fireplace area to really split it. Also, possibly put second rug in far ‘art wall area’. I think designing it as “two” rooms is going to be the answer! It seems to be a popular solution among my readers! I have my long MCM living room as two spaces, one around the TV with the couch on the long wall and a large recliner being the peice that divides the space facing the TV, an area rug joining the pieces. The other end has a cool desk facing the wall. I don’t see any way to arrange such a long room as one. I would def slide the couch over to the area rug and act as a dividing piece and the put the two chairs against the far wall, angled as they are for a sitting/reading area. Just an idea but can you define each end as its own space. Does the t.v. have to be over fireplace or could it move to other end of the room where couch is for cofortable viewing. This would leave the fireplace side of the room open for entertaining and nice sitting area by fire for curling up with a book or having visits with friends. I mean not to close of the two areas from one another but tv needs to be easier to watch/see and doesnt need to be on display for company. Kind of define but blend areas if that makes sense. Sofa in front of fireplace both chairs on left side. I agree with the previous commenters about splitting the room. I think that you should place the sofa in front of the fireplace and create a living space there. and then on the far wall, on the other side of the doorway, created a reading nook. Sometimes, when my kiddies are watching TV, I want to be near them, but I’m not interested in the show they are watching. Maybe create a multi-use space. Add book shelves, wall art, comfy seating and a table for hot chocolate or wine.